1615 sq.ft (40 ft Range) 360 DEGREE FULL SIGNAL COVERAGE! Suits for any type of houses! With this WiFi range extender, all the dead spots in house with weak Wi-Fi coverage will be eliminated! No more dead zones! Support extending signal to any devices. Dual high gain 3dBi external antennas enhance wireless signals for stable data transmission, offer you a reliable wireless network. It is stable with low radiation and low power with the Environmental design. Allows more users to share one account to access Internet. 7.The repeater will be setting successfully within the 30s. Then you can go to WLAN setting and connect to the new WiFi SSD. 【FULL RANGE & STABLE WIFI SINGNAL】CARANTEE wireless extender boosts an existing Wi-Fi coverage up to 1615 sq.ft (40 ft Range), 360 degree full coverage, and two 3dBi smart 180° detachable rotating antennas ensure better wireless performance and stability. We promise to eliminate all the Wi-Fi coverage dead spots and let you seamlessly connect with the network world anytime, anywhere. 【3 WORKING MODES】Repeater mode & router mode: Expand WiFi signal range and enhance WiFi stability with wireless router; AP mode: connect to a wired network and transform the wired Internet into a Wi-Fi access point. 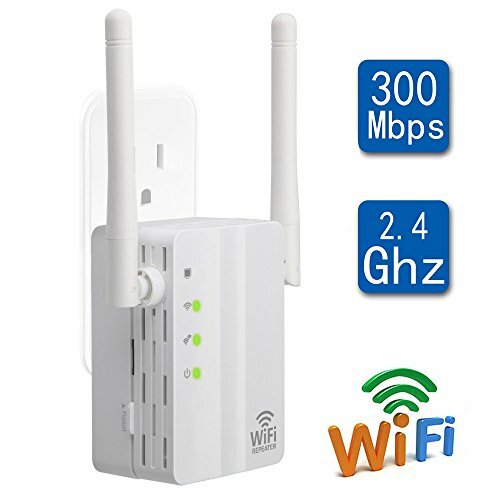 One wifi extender three function, professional level wifi repeater at a truly reasonable price. 【WIRELESS SECURITY】Multi-level wireless encryption options prevent unauthorized access and protect your important data. Enable wireless security encryption at a push of the WPS button.effectively prevent your Internet from being stolen, help you solve security issue of using public WiFi. 【FULL COMPATIBILITY】CARANTEE wifi range extender has been tested can be compatible with 99% router on the market, and works with any standard router or gateway. Compatible with any wireless network devices that comply with the aggrement of 802.11n (300Mbps), 802.11g (54Mbps) and 802.11b (11Mbps), so there's no need to upgrade your existing system. 【EASY SETUP & PORTABLE】 With software wizard, users can set up a personal Wi-Fi network in minutes. CARANTEE wifi repeater can remember the latest paired wireless networks, free you from resetting the device when restarting the router. Wall-plug design and good size to carry around,suitable for home use and travel. Low radiation and well made with strict quality control,safe to use for any age.